I am 59 years old. When I turn 60 years old, I should be welcoming my sixth grandchild. I will also be celebrating, on that day, my father’s 81st birthday. So, to me, September 2 is a day that I look forward to. It is a day to celebrate. It isn’t a day to lie about how old I am. Why are some people ashamed of having lived for so long? This is a question addressed in a Dec. 2018 Rotarian magazine. “America has always been a country that celebrated youth. According to one study, it was around 1880 that attitudes toward older people started to become significantly more negative.” They seemed to believe it was partly due to the “medicalization” of old age, as well as the growing portion of the population over 65. Youth worship has increased since the end of World War II. We are bomblasted with jokes about declining looks, declining memory, and declining reverence. Where in the past the love of youth was tempered with a respect for age, the respect seems to be going downhill. “Now we think of aging as simply an inexorable decline that ends in death,” tells the article author, Frank Bures. “And our fear of death has become pathological.” But Bures says we can decline to decline. “Harvard psychologist Ellen Langer took a group of eight elderly men, measured their biomarkers of aging, then took them on a retreat to a location she had decorated to look and feel like 1959. “After living for a week in a world that looked and felt 20 years young, er, Langer measured the participants’ biomarkers again. The men were found to have improved hearing, better memory, more grip strength, and increased joint flexibility and dexterity. They were taller and their fingers were longer. More than half of them were smarter. In photos taken after the study, the participants were judged, by impartial observers, to be younger than in photos taken beforehand. “Much of what we fear about aging – such as losing our hearing, eyesight, mobility, or memories – may actually be caused in part by our belief that we will lose those things. “One study led by Yale School of Public Health psychologist Becca Levy found that people who hold a negative view of aging die an average of 7.5 years before those with a positive view of it. Another study found that women who believed they were at risk from heart disease were 3.6 times more likely to die of heart attacks than women with the same risk factors who believed they weren’t. Talk about ripe … the Guymon Lions Club has been working for this community for decades. And they are the first group to report their community clean – up work this month. What an awesome group of people. They’re certainly a great part of who we are in Guymon. So, what’s coming up that fun? The Little Mermaid is at the Guymon Community Theater on Friday, Saturday, and Sunday. The sold out on Sunday and so don’t tarry on getting your reservations! Their telephone number is 580-338-0019. April 13 is a full Saturday. The Ready Group gathers at 10 am in the First Christian Church and their special guests this month is the Alma Folklorica dancers. That’s another great group that is part of our uniqueness here in Guymon. This group of High School kids are under the direction of Teri Mora and learn more than just dancing. They are there for many community activities, helping out. That same day is AggieFest at OPSU, a special event that they want their alumni to attend. Lots of various events, including a football scrimmage at 10 am. Music and fun in addition to football. That afternoon is a Mother Daughter Tea at the Nazarene Church, 2 pm. Call 580-338-3553 for more information. It’s $5 a person to attend. We also have a group of Nazarene Youth who are planning to do their community cleaning that morning of April 13. A few Easter dates coming in include April 18 for the Easter Egg Hunt and Coloring at the Guymon Public Library. And April 19 is the Easter Egg Hunt at Heritage Community at 2 pm. 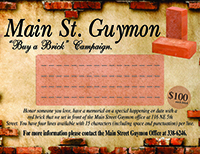 Come by the Main Street Guymon office on Friday at from noon to 1 pm if you would like to learn more about volunteering opportunities in Guymon. And while you’re here, pick up a ticket for the OPSU Women’s Basketball Fund Raiser BBQ plate to be picked up on April 20 for $10 or a $10 drawing for lots of great pork or beef, a fund raiser for Love Does (helping kids who are behind with their school lunches). Lots to do! Lots of opportunities to help! Lots of ways to have fun with friends and family.